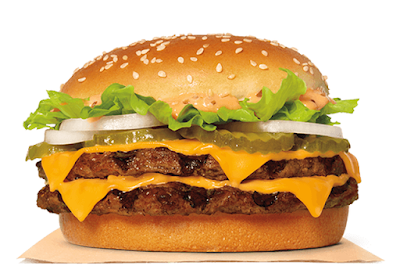 Burger King takes another stab at dethroning rival McDonald's Big Mac and comes up with the new Big King XL, the latest addition to their King line of big burgers. The new burger features two flame-grilled Whopper beef patties (a little over a 1/2 lb of beef before cooking), American cheese, sliced onion, pickles, lettuce, and special Stacker sauce on a toasted sesame seed bun. Burger King previously offered another Big Mac competitor called the "Big King" (which is why this one is called the "Big King XL") that was closer in size to the Big Mac and included a middle bun. I would say that the Big King XL is more like Carl's Jr.'s Big Carl. You can find the Big King XL at select Burger King restaurants nationwide for a limited time. The suggested price for the burger is $5.59. Through January 31, 2019, they're offering a deal where you can get one for free by selecting it along with an order of $3 or more on the Grubhub app. They're also throwing in free delivery on Burger King orders of $3 or more via Grubhub for a limited time.